Describing his love for New York and the East Village neighborhood, “It’s the only place to be… we pay rent here because you get to meet everybody”. When he first moved into the neighborhood, cab drivers wouldn't take him home. But that was the early 90's. Since then, Brennan has observed shifts in the ever-changing neighborhood. He watched as the squats were shut down, and watched buildings and community gardens get torn down in order to make way for new buildings. However, he's optimistic that, despite the shift, the East village "can never NOT be the East Village, with people coming from all over because they are attracted to the smallness of it. They are drawn to a place where you can't go down the block without talking to three people that you know." It was a city that was crumbling, so that it could be reborn. The ever so dapper Brennan greeted us in his East Village apartment, just a stone's throw away from The Stand. Brennan is one of the very few artists at The Stand who started in the arts early. He describes his childhood growing up as the kid who sported horoscope rings and weird pants made by his mother, also a silversmith and artist. Brennan grew up in Western Massachusetts, right along the Connecticut River, but owing to his father's job as a theater director in New York City, he was forever in and out of the city. After studying photography at Bard College, Brennan moved straight to New York City, where he began life as a photographer with magazines like the Rolling Stones. In a departure from his photography work, Brennan chooses to exhibit a different aspect of his creative world. Brennan meticulously cuts out headlines and images from The New York Times to form “collisions”. 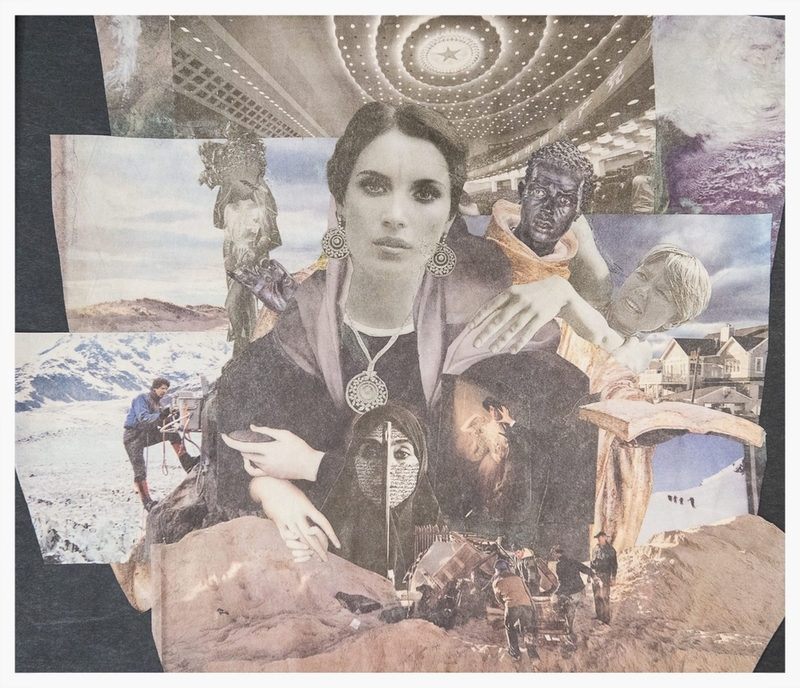 He describes these collages as a “slow sob," an outcry of sorts that makes life more palatable for him. 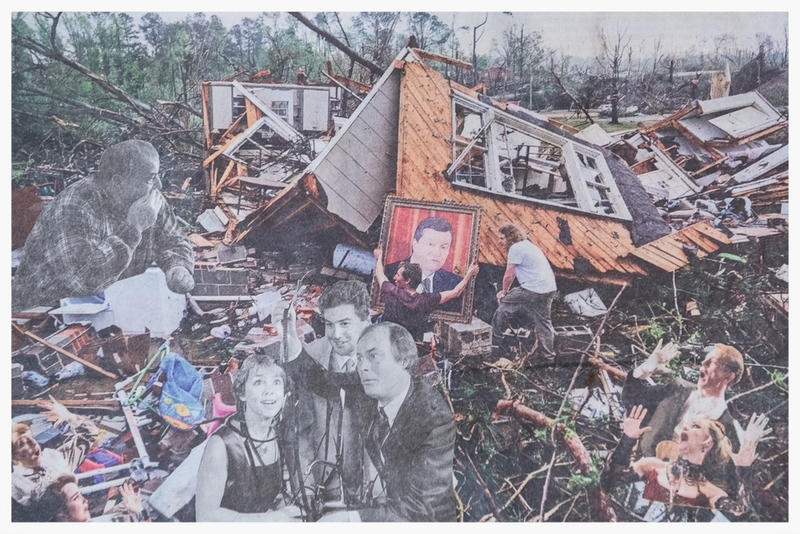 While his photography work captures “real anger, real disappointment and real ennui," his collisions allow a degree of healing to take place.Brennan begins by cutting the pieces out with an X-Acto knife, studying them, and seeing how the images go together based on narratives about how he sees the world. This meditative daily practice is a form of healing for him. By arranging and rearranging these juxtaposing images - from refugees escaping Assad to a vintage emerald bangle by Cartier - Brennan is able to exert some control over the maddening act of humans. Brennan recalls that the space that now inhabits The Stand was once a place to store beer for the Wholesome Foods deli. Then, one day, Lori appeared. She had started to clear out the tiny space and eventually had the iconic Bruce Lee painted on the roller doors. Brennan recalls that nobody could tell "if it was a popup, it was like a one-off, or a weekend, or if it was guerrilla, or if it was real." Nowadays, however, this tiny box on a corner is a vanguard of outsider art in the East Village. Like many of the other artists, Lori provides a unique space for Brennan’s creative energy – not only providing artistic guidance, but also concern for the health, happiness, and life of her artist community. At the opening of Brennan’s show at The Stand, he had classical music on one boombox and punk rock on another. A collision of music genres, it feels a perfect symbol not only of his work, but also of The Stand. By exhibiting all of these little pieces of artwork that won't show anywhere else, Lori is creating and building a community and a collision of characters – in the most beautiful and (art)felt way.